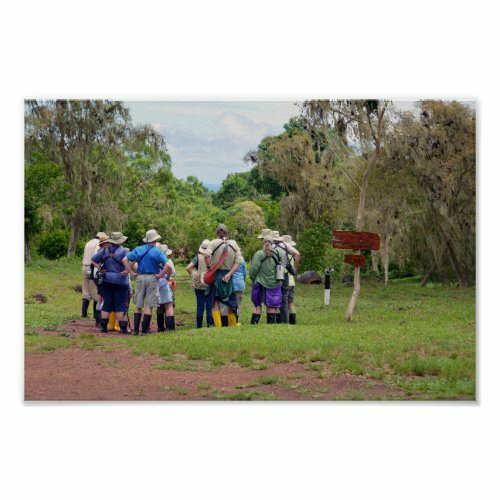 Tourists at a Tortoise Sanctuary in the Galapagos Islands. A Galapagos Giant Tortoise retreats into his shell as tourists in another group gather in the highlands of Santa Cruz Island in the Galapagos Islands to learn more about this magnificent creature. I visited the islands with my family in April 2015, and we toured the highlands was our first day. It was truly thrilling to see these giant tortoises in their natural environment. I remember seeing one in a zoo when I was a child. Children even rode them (I think I even did), which is a bad idea, and of course no longer allowed. They aren’t afraid of humans, but do make a chuffing noise if you startle them. The nasty little fire ant has invaded the Galapagos Islands. 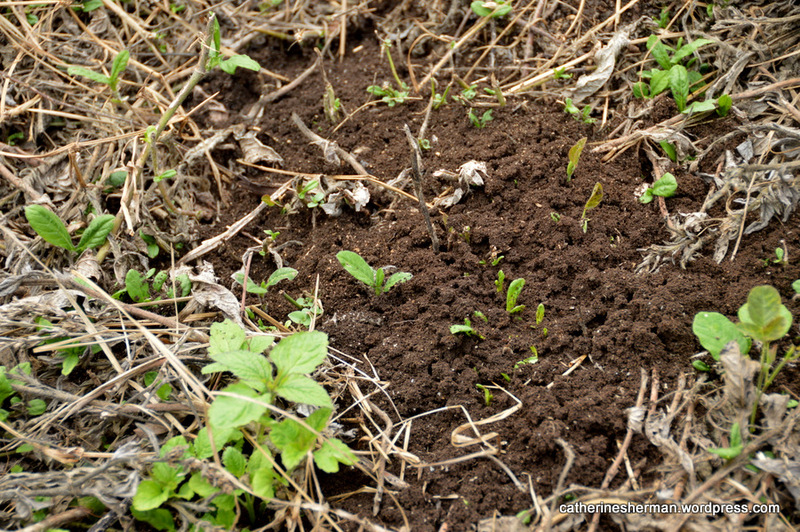 Here’s a fire ant hill in the highlands of Santa Cruz Island of the Galapagos. The ants found me before I found them, unfortunately. There are efforts in the Galapagos to rid the islands of invasive species, which have caused great damage to the native animals and plants. The tourists in the pictured group are wisely wearing rubber boots. Our guide offered us boots, too, but I was happy wearing my comfortable “sporty” flip flops, relieved to let my feet breathe after a long trip. Bad idea. I successfully evaded puddles and tortoise poop, but I stepped right onto an ant hill teeming with fire ants, an invasive species in the Galapagos. This was within two hours of my arrival on the island of Santa Cruz. I got about six painful, itchy stings on my toes. I’m no stranger to fire ants, so I know enough to wear closed shoes in grassy areas in Texas, but I wasn’t prepared for the little devils in the Galapagos. A yearling baby Galapagos Giant Tortoise, being raised at the Charles Darwin Research Station on Santa Cruz Island in the Galapagos Islands. Introduced predators threaten the eggs and young of the Giant Tortoise, so tortoise eggs are gathered, hatched and reared at the station. Wise old Galapagos Giant Tortoise. How the Galapagos Islands Were Named. The Difference Between Turtles, Tortoises and Terrapins. 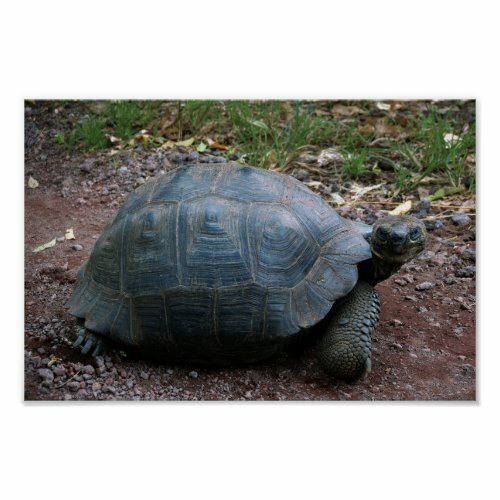 GIANT TORTOISE FACTS: The Galapagos tortoise or Galapagos giant tortoise (Chelonoidis nigra) is the largest living species of tortoise and the 14th-heaviest living reptile. Modern giant tortoises can weigh up to 5oo pounds (250 kg); even larger versions, now extinct, roamed every continent except Antarctica and Australia. Today, they exist only the Galapagos Islands, and Aldabra in the Indian Ocean. The tortoise is native to seven of the Galapagos Islands, a volcanic archipelago about 620 miles (more than 1,000 kilometers) west of the Ecuadorian mainland. With life spans in the wild of over 100 years, it is one of the longest-lived vertebrates. 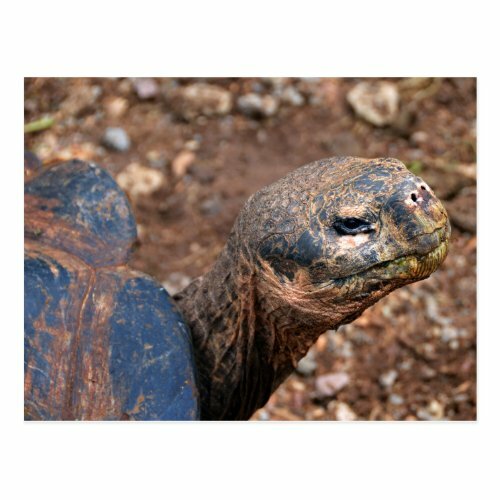 One of the most famous was “Lonesome George,” who died in 2012, the last Pinta Island Tortoise. Shell size and shape vary between populations. 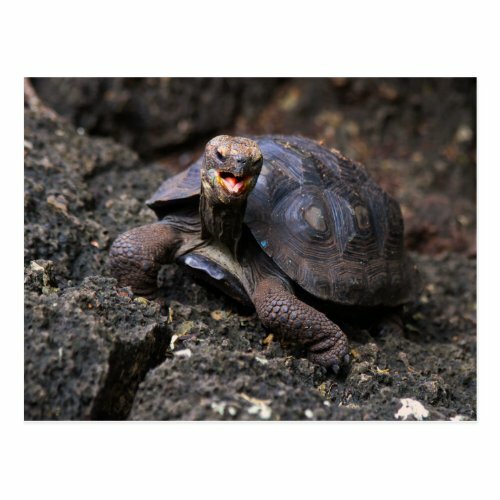 On islands with humid highlands, the tortoises are larger, with domed shells and short necks – on islands with dry lowlands, the tortoises are smaller, with “saddleback” shells and long necks. Charles Darwin’s observations of these differences on the second voyage of the Beagle in 1835, contributed to the development of his theory of evolution. Tortoise numbers declined from over 250,000 in the 16th century to a low of around 3,000 in the 1970s. This decline was caused by exploitation of the species for meat and oil, habitat clearance for agriculture, and introduction of non-native animals to the islands, such as rats, goats, and pigs. Conservation efforts, beginning in the 20th century, have resulted in thousands of captive-bred juveniles being released onto their ancestral home islands, and it is estimated that the total number of the species exceeded 19,000 at the start of the 21st century. Despite this rebound, the species as a whole is classified as “vulnerable” by the International Union for Conservation of Nature (IUCN). A bighorn sheep ewe, on the right, prepares to lead the herd on its trek across a highway in Rocky Mountain National Park. The ewe waits until most of the herd members line up and then she begins the procession. The sheep make the journey each day to and from two lakes in a meadow in the park. 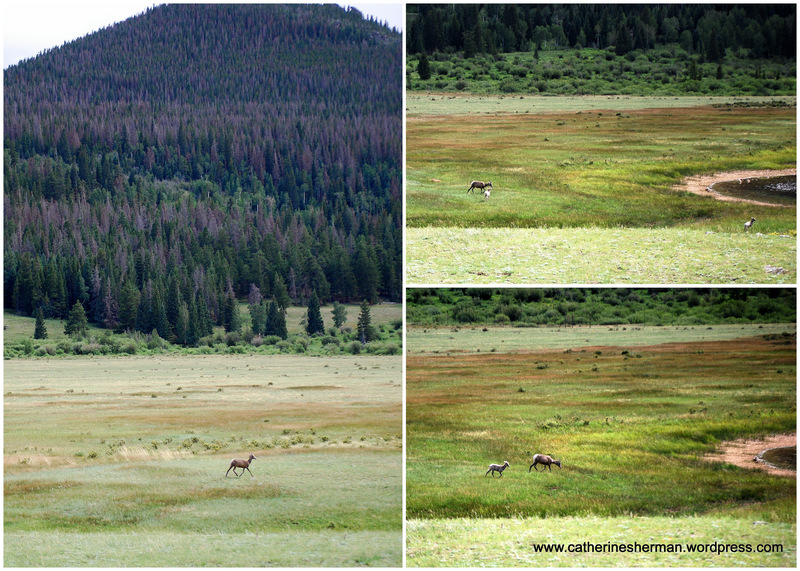 Not far from Estes Park in Colorado, bighorn sheep graze in a meadow near two lakes, “Sheep Lakes,” in Rocky Mountain National Park. The herd makes its way to the lakes from the mountainside each morning and then returns to the mountainside in the late afternoon. It’s a beautiful commute. Park rangers and volunteers manage the tourists and the cars on the narrow highway to allow the sheep safe passage. When the bighorn sheep are ready to cross the highway, park rangers and volunteers clear the road. The sign says no walking, but it also means no parking. This Hummer driver was confused! In the mid-1800s, thousands of bighorn sheep lived in the Estes Valley, but their numbers were decimated by hunters, by degraded environment and by diseases introduced by domestic sheep. At one point it was thought only about 150 sheep lived in the park, high in the mountains. The bighorn sheep in the low-lying areas were gone. It wasn’t until recent decades that through conservation efforts and reintroduction of new bighorn sheep that the population started to increase. About 600 bighorn sheep live in the park now. 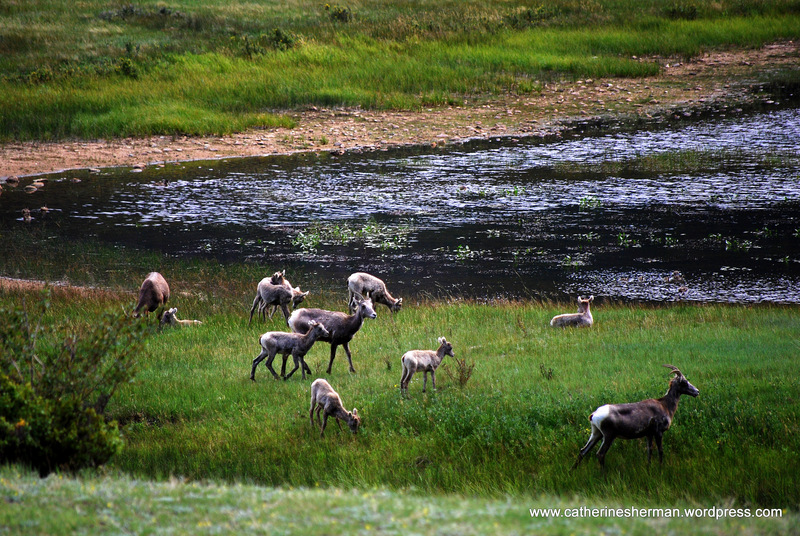 The herd near Sheep Lakes seemed to be all female adults and their offspring. 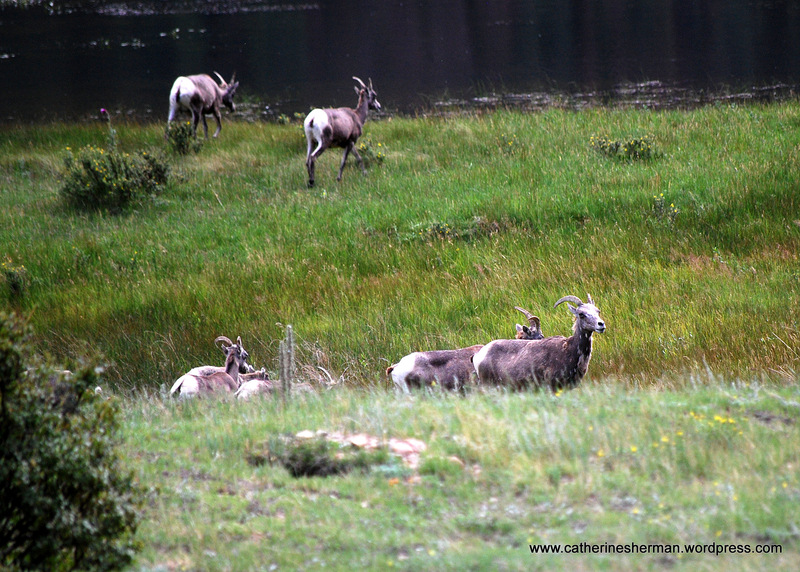 You can read more about the RMNP bighorn sheep in a link below. I saw one sheep move up the hill from the lake, and a few stood behind her. Soon, most of the herd was behind her. She waited there, alert, watching us silly humans in the parking lot. Even though we were probably a hundred yards away (I’m bad at estimating distances), she was wary. The rangers and volunteers make sure humans stay back because sheep can be easily stressed. 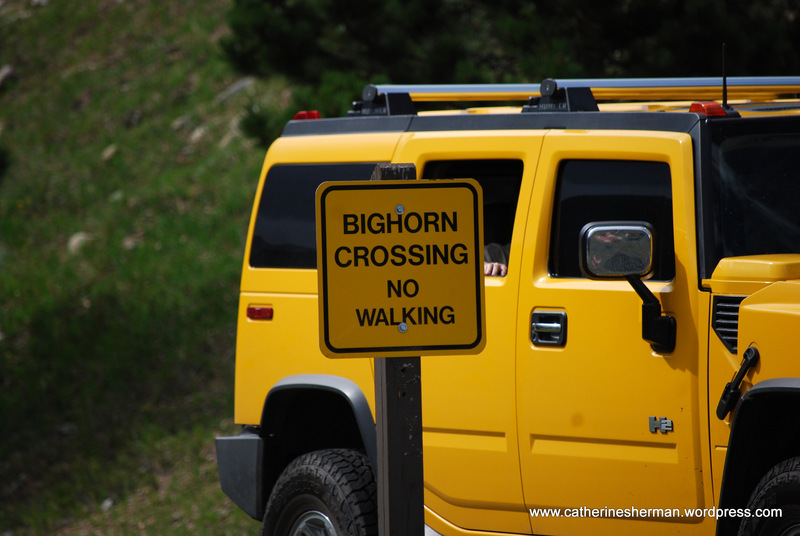 However, later, we saw bighorn sheep grazing by the side of the highway along Big Thompson River, butting heads and knocking each other into the road. They didn’t seem bothered by the traffic at all. I was worried for them! Eventually, the entire herd at Sheep Lakes gathered behind the lead ewe and then the sheep made their way across the road, where traffic had been cleared. Of course, just as with humans, one grazing sheep was oblivious to the departing herd. She looked up, saw she was alone, and then bolted to catch the herd. You can click on all of the photos to get a better look. You’ll need to backspace to return to this page. A bighorn sheep lamb nurses from its mother as the herd lines up and prepares to return to the hillside after a day in the meadow. Bighorn sheep graze at Sheep Lakes in Rocky Mountain National Park. 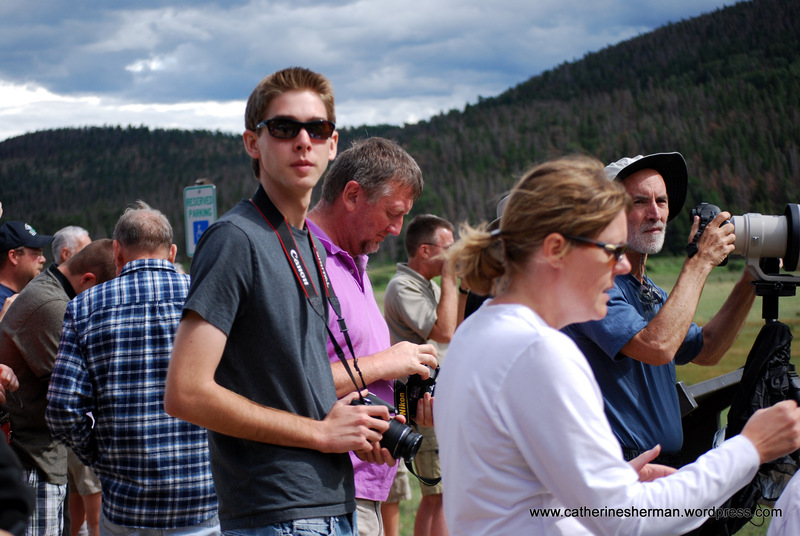 A crowd gathers to watch and photograph the bighorn sheep as they graze at Sheep Lakes in Rocky Mountain National Park. The most popular time is when the sheep migrate to and from the hillside over the meadow, which they do once a day. On the left, a ewe hurries back across the meadow to the herd. In the upper right, her lamb rushes out to greet her. “Mommy, where did you go?” In the bottom right, the lamb follows after its mother. 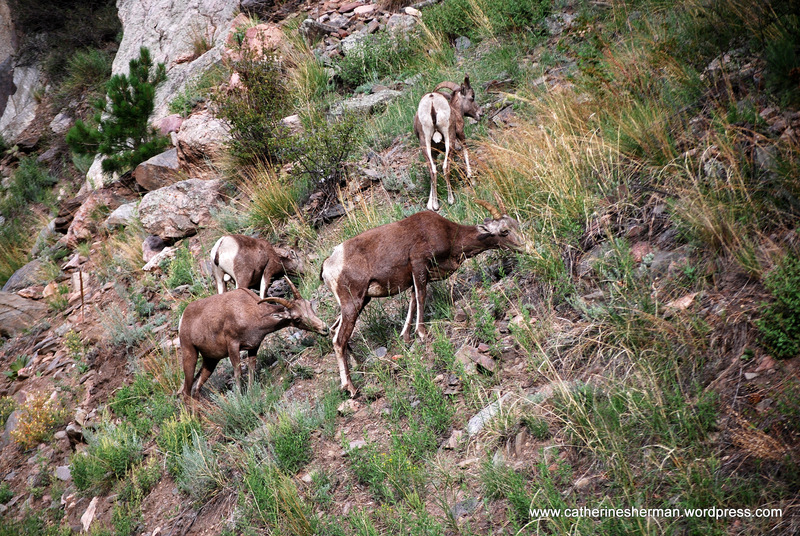 Bighorn sheep graze on the hillside along the Big Thompson River in Colorado. 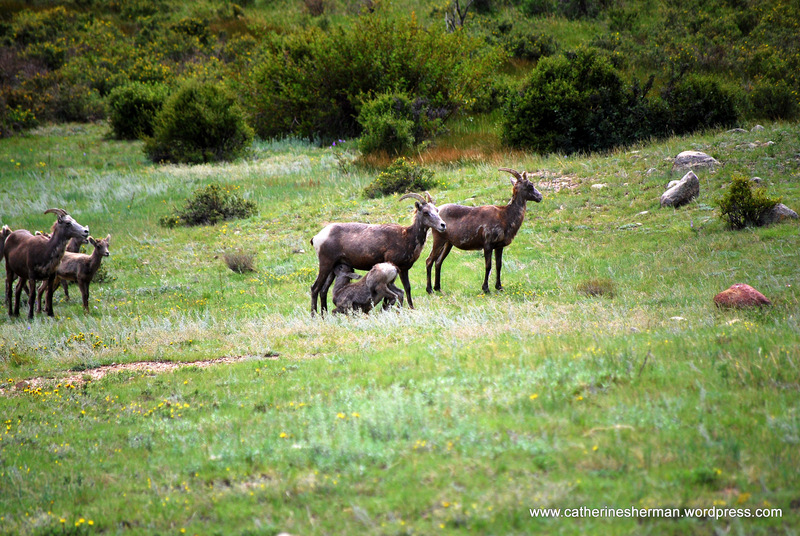 About Bighorn Sheep in Rocky Mountain National Park. Here is a section of a map showing the Sheep Lakes area, where a herd of bighorn sheep graze every day. We experienced a very hot summer in the Kansas City area with temperatures in the upper 90s and even into the 100s. Now, that it’s September, we’re finally getting some nice weather. I was lucky enough to escape the heat for a week in July when I visited Alaska, where the locals jokingly complained about a heat wave in the 70s. To cool myself upon my return to sweltering temperatures, I enjoyed some of my photographs of Alaskan glaciers. 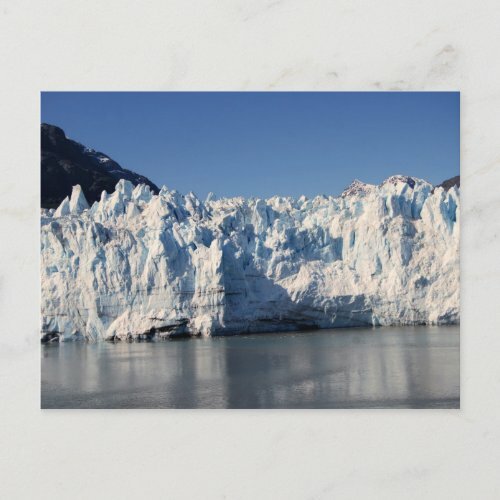 Margerie Glacier (in photo above) is one of several glaciers remaining in what was once a single vast ice sheet covering the Glacier Bay area of Alaska. We often hear of the rapid retreat of glaciers, particularly in the past few decades. I haven’t thought of the rapid advance of glaciers being part of relatively recent history, but Glacier Bay, which is at the top of the Alaskan panhandle, is only about 250 years old. It was carved in the early to mid 1700s when a relatively dormant glacier began to move rapidly. Its movement was described as being “as fast as a dog could run,” according to the National Park Service rangers stationed in Glacier Bay National Park. Glacier Bay is the result of the climate in the Little Ice Age, which reached its maximum extent in 1750. 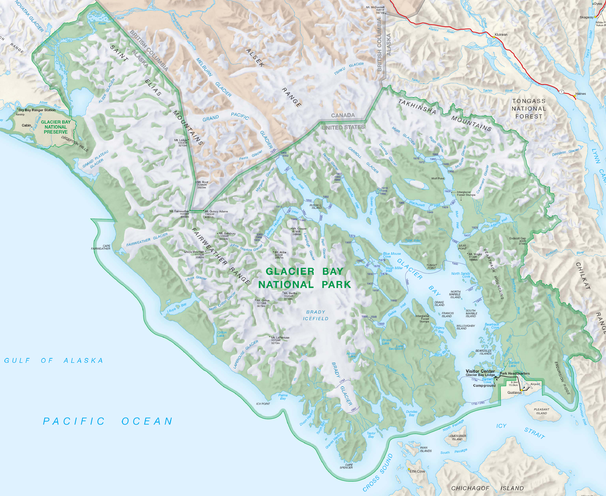 Click on this map of Glacier Bay National Park to see a larger view. I’d always thought that glaciers moved slowly and steadily slow. The glacier scours the earth as the massive ice field moves forward inch by inch and then slowly retreats, leaving debris in its wake and in mountainous coastal areas a glacier carves a deep bay or a fjord, such as Glacier Bay. I won’t be using the cliche “glacial speed” any more now that I know how quickly glaciers can Advance. Margerie Glacier is stable. Johns Hopkins Glacier is actually advancing. Both are remnants of a much larger glacier. This section of a U.S. National Park Service brochure, shows the advance and retreat of the glacier that carved Glacier Bay in Alaska. 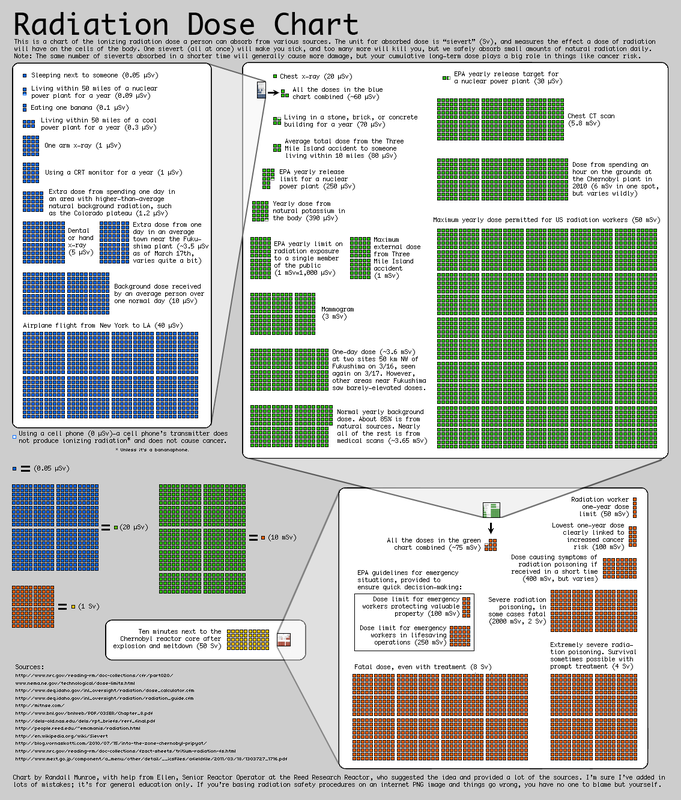 Click on the photograph to get a larger view. My friend Deb buys some tropical milkweed at the Monarch Watch Spring Open House at the University of Kansas on May 9. Monarch Watch Director Chip Taylor, at left in the yellow hat, and many volunteers were busy as the crowd snapped up the pollinator-pleasing annuals and perennials. The sale is a fund-raiser for Monarch Watch and also is a great way for people to introduce plants for pollinators in their gardens. It’s estimated that 80 percent of the world’s food crops needs to be pollinated. 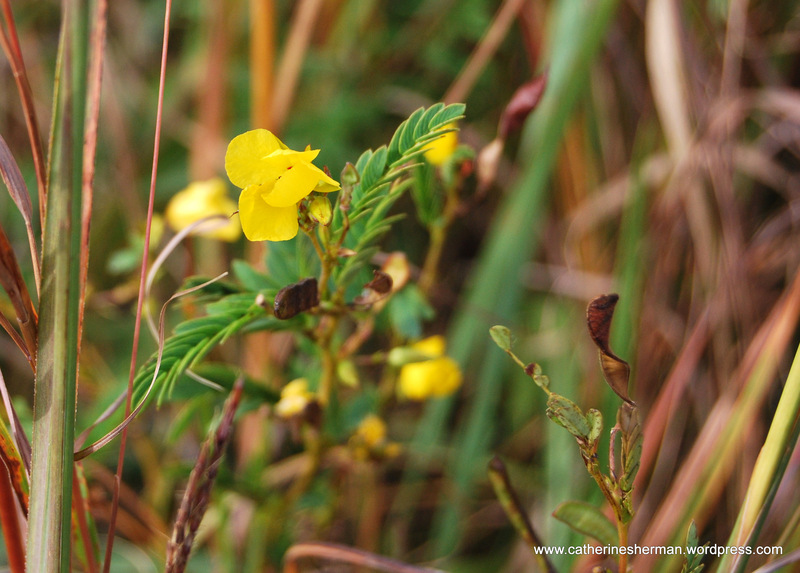 Habitat for pollinators is shrinking every year, while the demand for food increases. 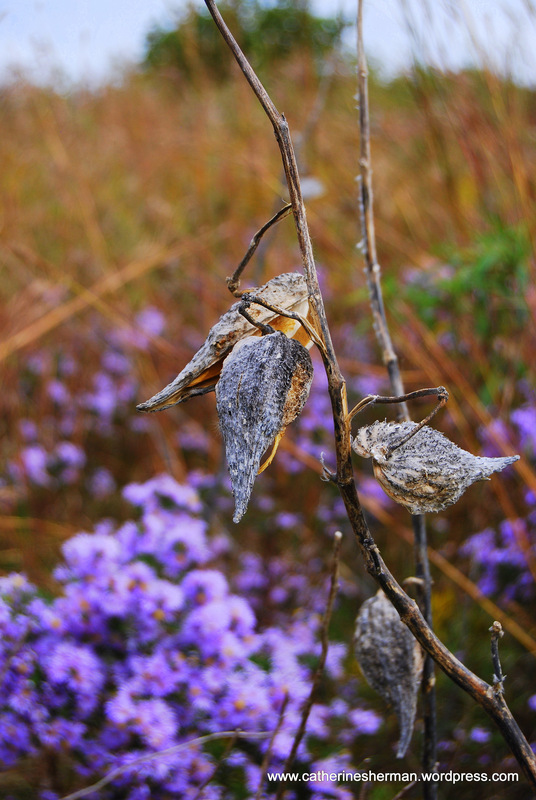 Monarch Watch at the University of Kansas in Lawrence is dedicated to promoting education about the biology and conservation of the Monarch butterfly and other pollinators. It works with children of all ages, involving schools, nature centers and other ogranizations. 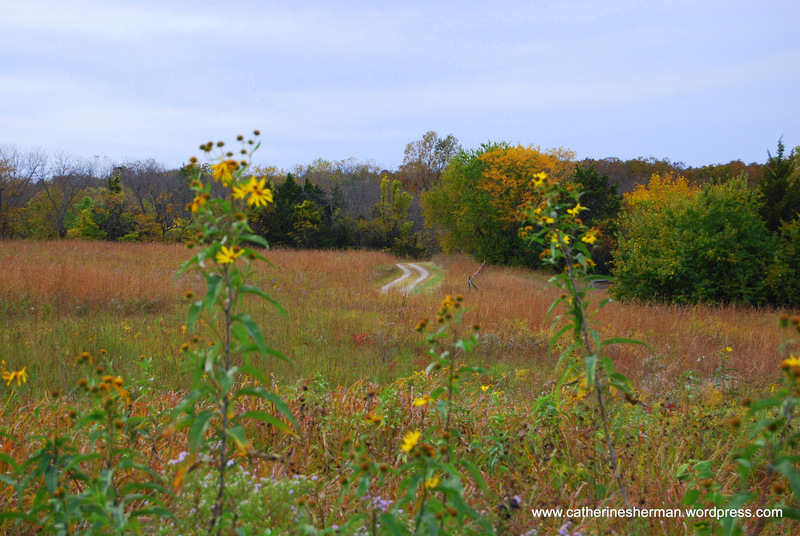 For more information, click on Monarch Watch and Pollinator Partnership on my blogroll. If you buy products from Amazon.com, you can also benefit Monarch Watch by clicking on the amazon portal on the Monarch Watch website to buy. There won’t be an additional cost to you. The following are photographs from the open house on May 9, except the last one which was taken in my backyard. These Monarch Butterfly chrysalides look like jade beads, trimmed with a thin stripe of gold leaf. They'll be placed in containers when it's time for the butterflies to emerge. The butterflies are then released, where hopefully they'll find food and habitat. Because of increasing development and changing farming practices, habitat and food sources for Monarchs are rapidly decreasing. Children have a good time at the open house, where there are plenty of fun science-related activities....and cookies, too! Monarch Watch promotes education about and conservation of pollinating insects and other pollinating animals. Visitors choose their Monarch Butterfly caterpillars, available for sale when you bought a milkweed plant. There were dozens of caterpillars munching away on milkweed in the white tub. These Monarch caterpillars await adoption. People who bought milkweed plants could also buy caterpillars to take home to live on the newly purchased milkweed plants in their gardens. Monarch Butterflies are busy in the mating enclosure. A Monarch Butterfly says hello to a young visitor. This honey bee dropped by the open house to visit some chive blossoms in the pollination garden. Monarch Butterflies weren't the only stars of the open house. Here are some silkworms. Honey bees thrive in a hive at Monarch Watch headquarters, which is on the west campus of the University of Kansas. 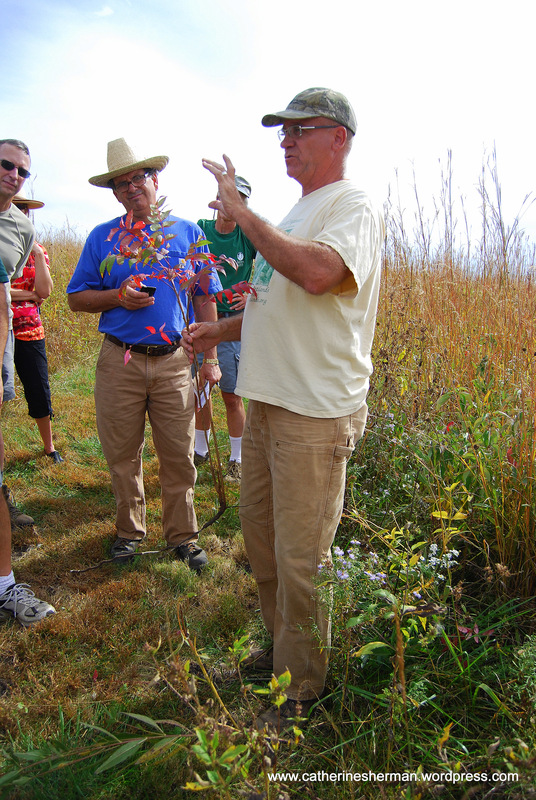 The Monarch Watch open house offered a wide range of annual and perennial nectar and food plants for butterflies and caterpillars. Not just caterpillars turn into butterflies. The Monarch Watch pollination garden is planted to attract and feed butterflies, bees and other pollinators, but it attracted me, too. 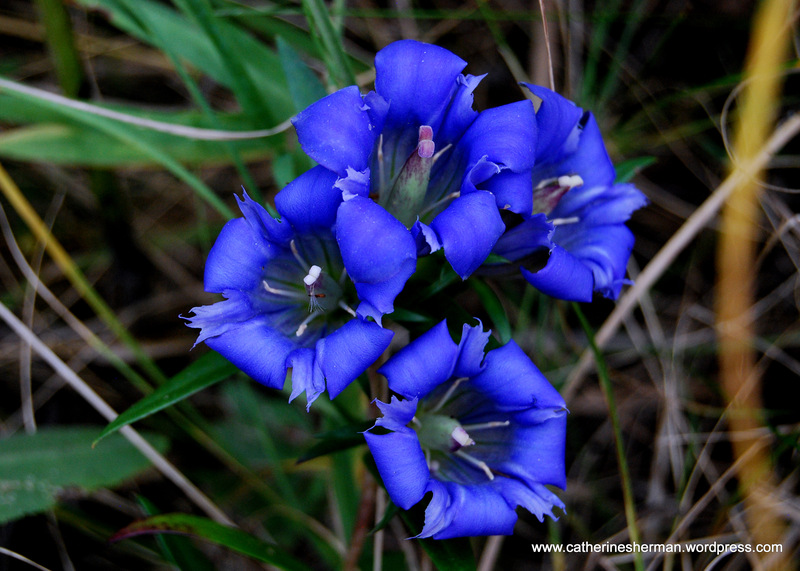 Isn't it lucky that plants for pollinators are also beautiful! Here's "Reggie," the Monarch caterpillar I bought, at home on a milkweed in my garden.